• Behavior Specialist - District wide Behavior Specialist responsible for providing behavioral support plans. Board Certified Behavior Analyst certification preferred. • LD Diagnostician - District wide LD Diagnostician responsible for evaluating academic achievement of students suspected of educational disabilities. • Social Worker - Elementary Social Worker responsible for serving under-resourced families. Coordinating school and community supports to ensure the successful participation of children in our schools. Promote the engagement of families in the educational process of their children. • Special Education Teacher - Responsible for providing direct instruction at Boscawen Elementary School to students requiring remedial instruction. • School Counselor - Webster Elementary School is seeking a School Counselor. This position is 4 days per week. • Speech/Language Pathologist - Merrimack Valley School District is seeking an individual with Master’s level SLP with CCC for a 2 day a week position in two of our smaller elementary schools. This position is 2 days per week. • Spanish Teacher - Merrimack Valley High School is seeking a highly motivated, certified Spanish Educator with a clear educational vision. • Social Studies Teacher - Merrimack Valley Learning Center is seeking a highly motivated, certified Social Studies Educator with a clear educational vision. 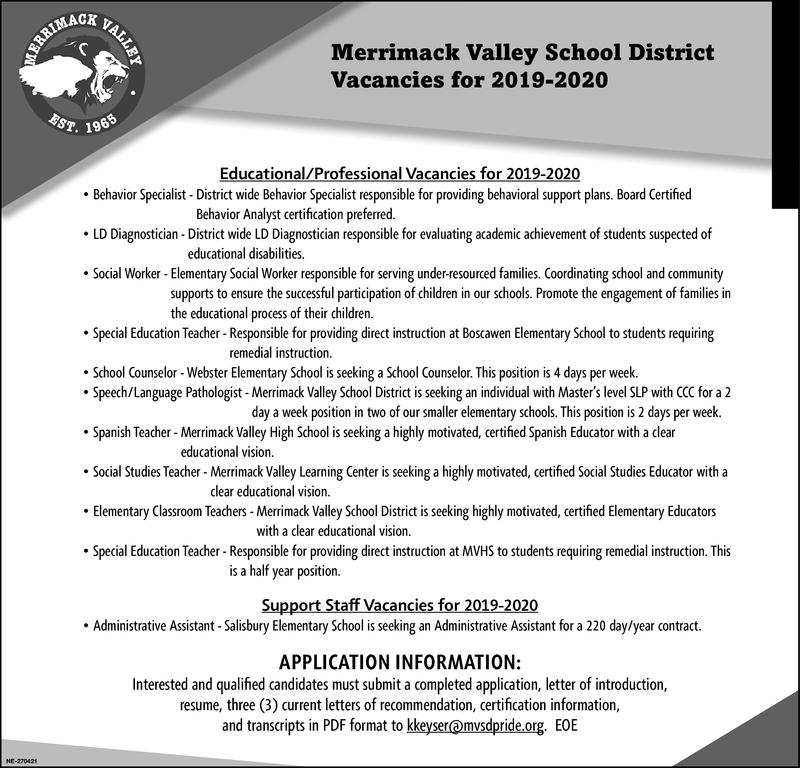 • Elementary Classroom Teachers - Merrimack Valley School District is seeking highly motivated, certified Elementary Educators with a clear educational vision. • Administrative Assistant - Salisbury Elementary School is seeking an Administrative Assistant for a 220 day/year contract.